AP, Jan 20, 2015: Worker at Japan’s wrecked nuclear plant dies after accidentally falling… the latest in a growing number of accidents at the site… [Tepco] said the worker, 55, died of multiple injuries early Tuesday after falling through an opening atop a 10-meter high tank… The number of injuries in April-November totaled 40 last year, compared to 12 a year earlier, underscoring growing concern about sloppy safety measures. AFP, Jan 20, 2015: A worker at Japan’s crippled Fukushima nuclear plant died after falling into a water tank. 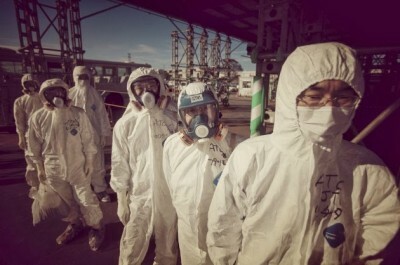 Separately, another worker died because of an incident at the Fukushima Daini nuclear power plant… The victim at the crippled Fukushima Daiichi plant, reportedly in his 50s, was inspecting an empty water tank… “He was wearing a harness, but the hook was found tucked inside the harness. This means the harness was not being used,” said a TEPCO spokesman. “We are investigating whether safety measures were appropriately observed,” he added… In the unrelated incident at the Fukushima Daini plant… a worker died after suffering a severe head injury after being caught in equipment, a TEPCO spokesman said. Reuters, Jan 20, 2015: Last week, labor inspectors warned [TEPCO] about the rise in accidents and ordered it to take measures to deal with the problem… “We are deeply sorry for the death of the worker and express our deepest condolences to the family. We promise to implement measures to ensure that such tragedy does not occur again,” Akira Ono, the head manager of the Fukushima Daiichi plant, said… The number of accidents at the Fukushima Daiichi plant, including heatstrokes, has almost doubled this fiscal year to 55… “It’s not just the number of accidents that has been on the rise. It’s the serious cases, including deaths and serious injuries that have risen…” said Katsuyoshi Ito, a local labor inspector overlooking the Fukushima power plant. Ito said inspectors were investigating the recent death. Jiji Press, Jan 6, 2015: Number of injured workers soars at Fukushima No. 1 nuclear plant [and] far exceeded the 2013 figure by November, [TEPCO] officials said… Thirty-nine workers were injured at the plant between April and November 2014, while one became ill. In fiscal 2013, which ended in March last year, 23 were injured… Last Sept. 22, a worker from a partner company suffered a broken back after being hit by a falling iron pipe while building a storage tank for contaminated water. During work to build a tank on Nov. 7, three workers were injured by falling steel weighing 390 kg. One was left temporarily unconscious, while another broke both ankles… Tepco believes the injuries were caused by poor on-site coordination and management by the partner company, according to the officials.